Three icons in one place: a great photo! 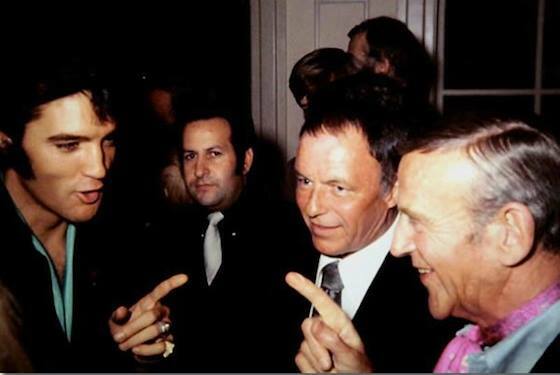 Ladies and gentlemen, you have Elvis Presley (the King of Rock ‘n Roll), Frank Sinatra (the Chairman of the Board), and Fred Astaire (Gershwin’s favourite singer and the screen’s most graceful dancer) in one shot. I wonder what the conversation was about? And I wonder what Joe Esposito was thinking (one of Elvis’ Memphis Mafia, in the background between Elvis and Frank). Three fabulous guys from the golden age of film and music. This entry was posted on Friday, November 22nd, 2013 at 12:00 pm	and tagged with elvis presley, frank sinatra, fred astaire and posted in music film, musicals, photographs. You can follow any responses to this entry through the RSS 2.0 feed.